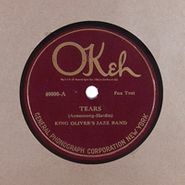 Tears is one of those heart rending melodies New Orleans musicians would often favor so they could rip up all those sentimental twists and turns with hot playing. There are plenty of breaks by Louis and he absolutely kills on this side. Buddy's Habits is noteworthy in that you can also hear Louis on slide whistle – Louis shines on this dime store instrument as well. There's wonderful playing by trombonist Honore Dutrey slipping and sliding around while Dodds, Louis and King Oliver entwine themselves around the main melody. After the slide whistle break the band kicks into gear and rides it home.